Glass Courses - JUDE STARK STUDIO at The London Stained Glass Co.
Jude has taught and tutored students throughout her career, including teaching the advanced diploma City & Guilds Stained Glass Course. Several of her former students and trainees have gone on to establish their own stained glass studios. Courses are held at Jude’s studio in Vanguard Court, Camberwell, a cobble-stoned inner-city oasis and home to a thriving community of dedicated, professional artists and creatives. (Scroll down contact page for details). For information about future courses click here. This short taster course is designed for newcomers to stained glass. 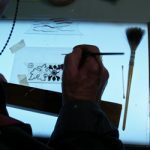 You will be guided through the steps and skills needed to create a simple glass piece using traditional stained glass making techniques. By the end of the course you will have a small completed panel to take home with you. Glass fusing is the technique used to bond glass pieces together by melting the glass at high temperature in a kiln. Amazing creative pieces can be made by using this technique. Glass fusing is an accessible and rewarding art form for all levels and all abilities. Experience the joy of glass fusing. This weekend is designed to introduce you to the limitless creative possibilities of the technique. 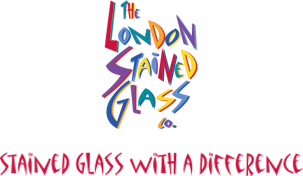 Whether you’re new to glass fusing or have tried it before, this weekend is designed for you. You will complete a number of pieces using different fusing techniques and will be involved in actual kiln preparation and firings. 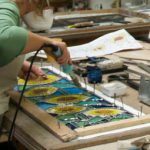 This well-structured course is a wonderful opportunity to immerse yourself in stained glass design and making for 5 consecutive days. It’s perfect both for beginners who want to learn to make stained glass and for improvers who want to make their own panel but still require guidance and help. 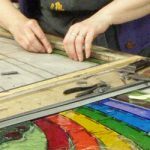 You will have access to Jude’s extensive stained glass design and making experience throughout the whole of the course with tutorials, demonstrations, hands-on making, one-to-one tuition and lots of insight and useful information. You will need to give some thought to your panel design prior to attending the course and prepare some colour sketches or designs to bring along. If you are making a panel to install in an existing window or for a specific location, the design ideas and the size of the panel will need to be approved before the start of the course. It must be feasible to complete the panel in 5 days. 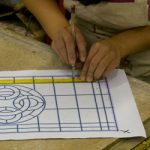 This course is perfect if you have previously attended a one or two day class as it will help you gain confidence and deepen your understanding of stained glass skills. On this course you will complete a panel of your own design.